Unlike humans, we canines don't think we're all created equal. Me, I tend to be polite to just about any dog. Still, I don't feel particularly submissive to (or even interested in) that Mini-Pinscher dancing around my heels. Though I do grow rather carefully respectful when some big ole Wolfhound decides to sniff my behind. We dogs know equality is overrated and that figuring out our position in the pack is something we've got to pick up quickly if we want to avoid having our fur fly. But, the downside is that there are just so many differences to figure out if you're a dog, and for this I blame my breeding-crazed biped brothers. They've been shuffling our DNA like a pack of worn playing cards for thousands of years now. The result? So now they think our doggish diversity will help them figure out exactly which genes are responsible for what. Pretty soon I expect they'll find the frisbee-catching gene and the housebreaking gene and don't-chase-the-cat gene and start putting them all in our dog chow or something. See, I don't much trust scientists, whom I consider several notches spookier than your run-of-the-mill veterinarian. They seem just too intent on slicing, dicing and pureeing our canine genetic code. I guess there aren't enough different breeds of guinea pigs, so they've got to run their instruments through our genetic code like Mike runs his fingers through my fur looking for ticks. That makes us all Labs now: genetic laboratories in which humans can explore the most basic components of our doghood, satisfying their primate curiosity and looking, as always, for new tools to wield against the natural world. I hope it pays off for us dogs somehow. Maybe a natural resistance to kennel cough? The end of hip dysplasia? Still, I worry. If old-fashioned humans broke our ancestors down into hundreds of different breeds, think about what new-fangled future humans might do. Please, scientists, be more humane than human. Don't fuse our genes with those of cats, squirrels or birds. 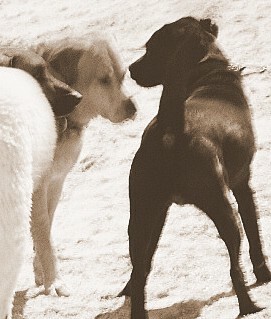 Being a social animal is already plenty tricky for us diverse domestic canines. An alpha dog that squawks like a parakeet would be just too much to bear. [By the way, The Bark has links to a number of articles on whole dog genome gig]. You made a lot of good points Hank! It's true - many dogs in the world are suffering because of careless overbreeding, backyard breeders, puppymills, etc. Maybe if they can figure out how to breed sterile dogs so that backyard breeders and puppymills won't be able to just keep breeding more and more dogs...then maybe shelters won't be so full. My mom read an article by a wolf expert who said that of all the breeds of dog, the Siberian Husky is the least genetically manipulated. Maybe that is why so many Huskies have sensitive stomachs, and why we tend to have a high prey drive. Interesting stuff! thanks for checking out the halifax blog.........I was starting to wonder if people looked at it. IT does not have the star power of a chocolate lab to attract people haha. This is an interesting post. Genetics is always a tricky issue, as who can decide when something is truly for the good of all dogs (for example, getting rid of genetically-caused diseases) or just manipulation. First of all, welcome back Hank from your blogging absence. Those scientist need to leave things alone, & just let us be dogs. Too bad sometimes when short-sighted humans play around with making a "purebred".Over 85% of collies have genetic eye disorders. My family tests "normal" which is great, but think of all the others with severe problems and the problem is getting so bad, they've created a new standard called "go normal" for dogs that have it in their genes but pass a certain test. And this is true within most purebreeds - there is something ticking away inside so many dogs waiting to be set off. Good old fashion mutts have the best chances, and as a male, I'm attracted to just about all of them. Except the realllly tiny ones - I have no idea of how to begin with those! Yeah, dogs are remarkable to humans, but not because humans have manipulated our gene pools, but because we are the best companion animals for humans in the world. Most of us like kids and love to exercise and eat just about anything they throw to us - what's not to like? All true, but I do think a dog that was more like cats would be a good thing...HAHAHAHHAHAHAH J/K! Very good essay, Hank. I totally agree with you. Humans just may be too smart for their own good what with their constant tinkering with nature without giving thought to the long-term consequences. We may have to unite to put the big bite on them. 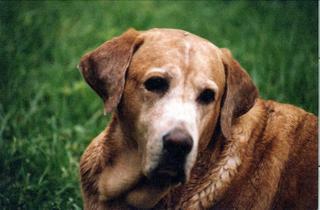 hi hank,a bit off-topic- we are at the mercy of genetics.I'm a lab,like yourself,and my owner puts me down over my weight,man.She thinks i'm so wide across the back she calls me a table.It ain't fair-you know how it is-gotta eat everything in your dish.My parents were big,I'm big-hey maybe there's a thyroid problem.As slack as my owner is to call me a table she's typing this for me-she knows what i'm thinking and that i need to express myself.woof!,barkly the lab. You're right that there are a lot of careless breeders out there and a lot of dogs suffer as a result. I get particularly worried when dogs become targets of cloning. Did you know that the cloned dog was called the year's most amazing invention in 2005? It made me mad. You can invent a cloning process but you can't "invent" dogs. Canids have been around for at least 40 million years! I know that a lot of good can be done with genetic research, but a lot of evil, too. It's strange: clone a dog and you become a hero; clone a human and you go to prison. My pleasure. Hope you're holiday are great! Yes, we dogs are used to some manipulation and we're not too bad at manipulation ourselves, but there should be some limits. You're right. The end of cancer, etc. sound like very worthy goals, but I worry about the less-worthy goals such as genetic makeovers done strictly for entertainment purposes. Humans aren't so good at knowing where to draw the line depsite their "sapien" name they've given themselves. Thanks! This time of year gets pretty busy for us dogs, doesn't it? Yes, turkey is a fine topic of conversation. Can barely wait for Christmas dinner! I think you're right. We were probably pretty good companions from the get go, being social animals for millions of years. We were likely good companions first and only later did a lot of the breeding take place. Hey, do you really want them to invent a dog who can climb trees like a cat? On the other hand, I always have wanted to be able to purr. Very cool ability. Biting the hand that feeds us? You know, only you cats can get away with that! And they say dogs are lucky. We Labs are always fighting the battle of bulge, I'm afraid. But those extra layers sure do help when swimming in cold water, don't they? And they're always a good excuse to convince the humans to walk us. Welcome to my dogblog or dlog. I'd pee on it if I could but my person Mike already yelled at me for trying. (Humans are so tense.) He says I've got a lot to learn about dlogging. I said it'd be better if we could all just smell each other here, but I guess this is still a primitive medium. Too bad. Well anyway, I'm a Yellow Labrador living in Florida. Welcome to my dog's life. I wag at you. I sure hope we can smell each other one day.